If you have been considering registering for a Certified Zentangle Teacher (CZT) seminar, we have good news . . .
Our 2015 Seminar Registration is now open! Details below . . . . The best way to learn how to share the Zentangle Method and Artform with others is to become a Certified Zentangle Teacher . . . a CZT. We invite you to join us a one of our four CZT training seminars in 2015 in Providence, RI, USA. CZT seminars are special events. I have returned home from the 16th Seminar. I feel like I travelled through the "wardrobe" in the Chronicles of Narnia. The seminar was another world. Thank you for one of the most worthwhile experiences I have ever had. It surpassed my expectations by miles! At first, I thought "We all know how to tangle. How can they fill three days of seminar?" Well! Every minute was filled with substance and enrichment. The hotel was wonderful and the food was good (I over ate.) But what I loved most was the refinement, polish, and high quality of the materials and presentation. I want you to know that the beauty of the total experience was not wasted on me. A thousand thanks to you and Molly and to all your great staff. Many thanks for the wonderful learning experience at CZT Seminar 16. It was right at the top of my life experiences ...... and I am pushing 72!!! In addition to yours and Molly's teachings, you thought of all the extras. Amazing were all the niceties and I felt like we were treated like royalty. Now that I have digested everything, I am anxious to teach and spread the love for all things Zentangle. Here are the dates for our four 2015 seminars. All seminars begin on Sunday evening and end late afternoon on Wednesday. 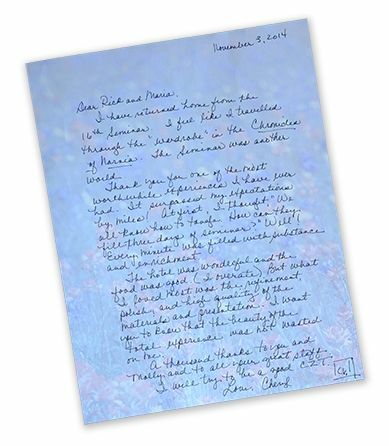 We just received this letter yesterday from a CZT about her experiences teaching the Zentangle Method. We thought you would like to read it in the context of announcing seminar registration. I continue to enjoy teaching Zentangle classes, and to do lots of exploring myself. I have a few stories to share with you this morning. Julie is a woman in my classes who is in her 70's. Julie's heritage is Native American, and when she was a little girl, her grandmother taught her a "Corn Grinding Song." She told Julie that a woman's work is boring, and tedious at times - but crucially important for her family. She taught Julie that it helped to have a song to sing while doing these tasks. Then she taught her the Corn Grinding Song, a little song that she had created to sing while doing her daily tasks. Julie had not been able to remember this song for 10 years, and had been very sad that she had lost it. She was very excited one day when she came to class, and could not wait to tell me that while tangling that week, this Corn Grinding Song her grandmother had taught her had resurfaced. [One of my students] suffers from Parkinson's disease. She took her Zentangle work with her when she visited her doctor, and he was very excited to see it. He told her that doing Zentangle art would not only improve her eye-hand coordination, but that the improvement in her muscles in her hands would have a generalized effect that would improve her muscle coordination throughout her body. Another morning there were only three women who showed up for our Zentangle class. My students always enjoy mornings like that, because it creates a more intimate setting. I began a discussion about how doing Zentangle art has improved my own creativity in other areas. All three students became very animated. One is a professional jeweler, and began talking about how she was branching out into more creative areas with her design work. She talked about how her design work was becoming more inventive. Another is a quilter, who has been entering quilt shows for years without winning any awards. She said that the last show she entered she had won two blue ribbons and also the "best of show" award, and that she was confident this was due to the way the Zentangle Method was opening the doors to creativity in her brain. The third woman was having a similar experience, though I have forgotten the details of her story. My own personal experience has been that creating in a Zentangle way has helped me set aside my perfectionism. I have learned to recognize the creative urge, and gained the confidence to simply follow it. I tell my students all the time that when they wonder "what if . . . ", that IS their creative voice. I encourage them to follow it and see where it leads, and that in doing so their creative voice will become stronger and stronger. In our last seminar we had people from 13 countries attend . . . talk about making friends from all over this world! We look forward meeting you in 2015!